2011 is OVER. Time to close that great chapter, and begin the next. 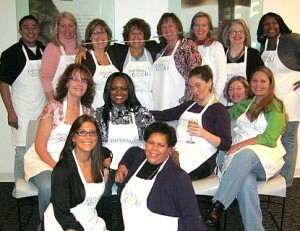 There’s just a little something we have to take care of first… This post is Part I of the final round-up of our corporate team building events and private cooking parties for 2011! 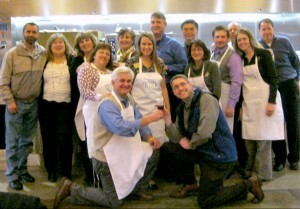 In mid-November, McGraw-Hill Higher Education hosted the first of a series of Parties That Cook events for a mix of staff and customers in Chicago. After finding us through an internet search, host Megan G. thought we had offered the most flexibility, the best venues… and “awesome recipes!” On working with our Chicago event planner, Megan said, “Christina Turner is top notch! She is a real asset to your organization. Right away, everything went smoothly and she made me feel completely at ease with the process. 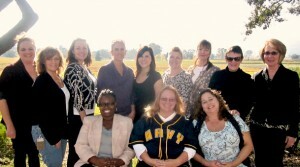 She was professional, friendly, and accommodating.” What kind (yet accurate) words! A few days later, Genentech hosted an intimate Chef’s Table, 4-course meal for 13, at the gorgeous Mumm Napa. Host Lisa D. is no stranger to Parties That Cook, and opted to stick with us after a successful first experience. On working with veteran event planner, Rosie, she commented, “Rosie made the event seem super easy and everything was organized and complete in a timely manner. The party was wonderful! The best part was the teambuilding and fun!!! !” *No exclamation marks were added to this statement.